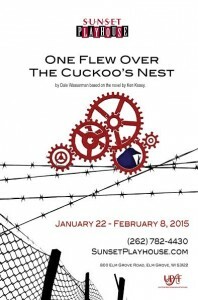 ONE FLEW OVER THE CUCKOO’S NEST opens on January 22 and runs through February 8th. This is going to be a must see production. Michael Pocaro and his cast have been rehearsing 6 nights a week to be ready for the show. Many of you will remember the movie of ONE FLEW OVER THE CUCKOO’S NEST was released in 1975 and was directed by Miloš Forman. It is based on the 1962 novel One Flew Over the Cuckoo’s Nest by Ken Kesey, and starred Jack Nicholson, Louise Fletcher, and Will Sampson. The film was the second to win all five major Academy Awards (Best Picture, Actor in Lead Role, Actress in Lead Role, Director, and Screenplay) following It Happened One Night in 1934, an accomplishment not repeated until 1991 by The Silence of the Lambs. If you don’t already have your tickets for this show, be sure to call our box office at 262-782-4430 or order on line at sunsetplayhouse.com. Please note: ONE FLEW OVER THE CUCKOO’S NEST is suggested for mature audiences only due to language and adult situtations.